What’s the first thing you think of when you think of food? For most of us, it gives us a warm fuzzy feeling. Now think of hunger. Feel a little gloomy, sad and perhaps even frightened? Our nation is blessed to have plenty of food. Even so, your average American doesn’t have enough food in its cupboards to get through two weeks…or at least anything they really want to eat. That’s why it is still there. You don’t really like it or you would have probably eaten it by now. Food preparedness really isn’t difficult, it just takes a plan. I have created a system that gets you organized and takes the chaos out of emergencies. Food preparedness comes down to having food available and a way to cook it. The plan consists of Getting Started Steps 3-5. The activities that accomplish those steps are cued daily in what I call Daily Tasks. 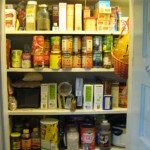 If you haven’t done so already, read Getting Started, Step 3 – The Pantry. Now, I have a challenge for you. Take all the food out of your cupboards and laid it on the counter. Do you have any idea what you can do with what you have? Sure, if you are hungry enough, you can eat pork and beans or plain pasta for days, but do you want to? Now read Step 4- Planning your Menus. Even if, for some reason, you don’t wish to work on a long term, prepared pantry, it is wise to plan for at least two weeks of simple, emergency meals. Finally, read Step 5-Pantry List. Print off a pantry list and work on that. You are already farther ahead in your emergency planning! Once you know what you will eat, there are a few things to consider. What if you couldn’t use your kitchen stove or oven? Do you have an alternative way of cooking food? You can use a grill (outside, only!) a fire pit or inside wood stove to cook on. Choose a way that works for you and plan. in advance, how to cook your food in an emergeny. Then make sure you have what you need to make that happen: charcoal, wood or gas. Will you need alternative cooking pots or utensils? You may need a dutch oven or cast iron for cooking over fire. Will you need a tri-pod or grill grate over your fire pit? Practice cooking your food to make sure it works and you have what you need. Make notes in your homestead journal so you don’t forget how you will cook each recipe. The kids will love this “camping” cooking and you might find your alternative cooking method so fun, you do it even when you don’t have to. This might seem obvious but you just never know how many electric gadgets you use until you don’t have power. Do you have a non- electric can opener? You should have one and don’t buy a $1.99 one that will hurt your hands and fall apart. (Yep, I tried to save a buck and the dumb thing broke in two.) Buy a nice one that turns sharply and easily. Have at least one good cooler on hand. Most of us already have them but they are life savers should you need to store food on ice. In a power outage, use the food in your fridge first and then the freezer. Do not open the freezer unless you need to and when you do, take a few days worth of food out and put in the coolers. Refrigerators and freezers are very insulated and if left closed, they can stay cold a long time. If left undisturbed, your freezer can keep your food frozen for up to a week. Have paper plates, bowls, cups, and paper towel on hand. If you are in an emergency state, it is likely you won’t want or be able to do dishes. Add heavy duty foil and plastic wrap to your pantry list, as well. In the end, it comes down to planning what you will eat, getting it stocked and knowing how you can cook it. Commit to doing the daily tasks and those little steps will take you will be where you want to be: prepared! Tomorrow’s article will be for the true backyard homesteading spirit: two things you can grow to never be hungry again.